Get this pattern and hundreds more with a quick and easy download at e-PatternsCentral.com! You'll find a wide variety of crochet patterns including this quick and easy afghan. 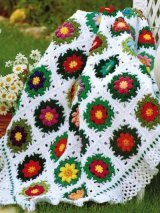 Colorful granny squares and a lacy border showcase this pretty, feminine afghan. Don't miss out, head to e-PatternsCentral.com now! Thanks to the internet Jennifer is safe at home. 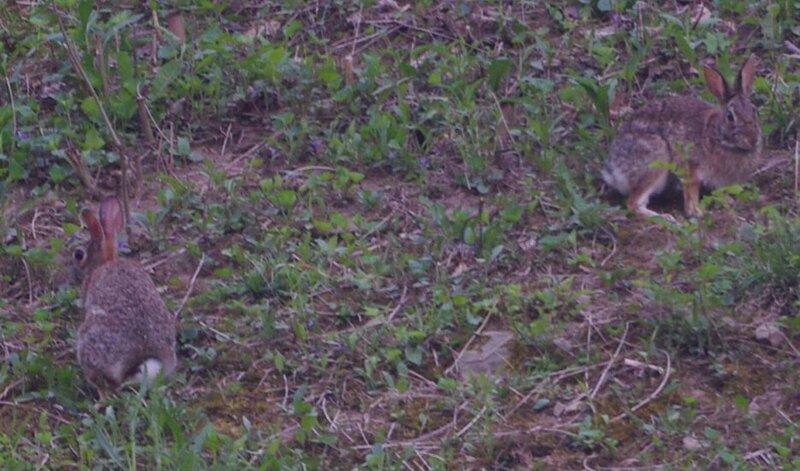 Bunnies in our yard... click on the picture to see a full-size photo. Does anyone know if the Crochet Guild of America and the Knitting Guild of America still exist? "A negative attitude is like a flat tire. You’re not going far until you change it." Then some Pharisees and scribes came to Jesus from Jerusalem, saying, "Why do Your disciples transgress the tradition of the elders? For they do not wash their hands when they eat bread." And He answered and said to them, "And why do you yourselves transgress the commandment of God for the sake of your tradition? For God said, 'HONOR YOUR FATHER AND MOTHER,' and, 'HE WHO SPEAKS EVIL OF FATHER OR MOTHER, LET HIM BE PUT TO DEATH.' But you say, 'Whoever shall say to his father or mother, "Anything of mine you might have been helped by has been given to God," he is not to honor his father or his mother.' And thus you invalidated the word of God for the sake of your tradition, You hypocrites, rightly did Isaiah prophesy of you, saying, 'THIS PEOPLE HONORS ME WITH THEIR LIPS, BUT THEIR HEART IS FAR AWAY FROM ME. BUT IN VAIN DO THEY WORSHIP ME, TEACHING AS DOCTRINES THE PRECEPTS OF MEN.' "
Therefore, I exhort the elders among you, as your fellow elder and witness of the sufferings of Christ, and a partaker also of the glory that is to be revealed, shepherd the flock of God among you, exercising oversight not under compulsion, but voluntarily, according to the will of God; and not for sordid gain, but with eagerness; nor yet as lording it over those alloted to your charge, but proving to be examples to the flock. And when the Chief Shepherd appears, you will receive the unfading crown of glory. You younger men, likewise, be subject to your elders; and all of you, clothe yourselves with humility toward one another, for GOD IS OPPOSED TO THE PROUD, BUT GIVES GRACE TO THE HUMBLE. Humble yourselves, therefore, under the mighty hand of God, that He may exalt you at the proper time, casting all your anxiety upon Him, because He cares for you. Be of sober spirit, be on the alert. Your adversary, the devil, prowls about like a roaring lion, seeking someone to devour. But resist him, firm in your faith, knowing that the same experiences of suffering are being accomplished by your brethren who are in the world. AS LONG AS WE DO NOT PRACTICE IT." and you shall receive the gift of the Holy Spirit." ? Did you know you can recycle yarn from a sweater? Keep in mind that you do not have to go out and purchase a sweater to recycle yarn. * you already own... maybe you loved the yarn but the sweater isn't in style anymore. * belonged to your child but he/she grew out of it. You don't have to make a sweater from yarn recycled from a sweater. There are tons of other projects you could make, a tote bag or a purse. To keep your yarn from twisting, change the direction you turn your work after you've completed each row.Turn your work clockwise after each even numbered row and turn it counterclockwise after each odd numbered row. I carry the old color through the work to the point where I will need it again. I never cut the yarn until I don't need it anymore. Thanks for such an informative newsletter. I know it's a lot of work and it shows! I'm glad you liked this pattern. I do have a 9 x 12 carrier on my design list for a future pattern. "This forum appears to have some errors in archive #0 and cannot be viewed until the forum admin fixes it with a Message Rebuild. I just wanted to say thanks for letting me know about the message board. Every now and again it gets messed up and I have to do go through a rebuild function in order for the messages to be visible again. Not sure why that happens but it is easily fixed. Even if the message board isn't working... the rest of my website still works. The message board is a service we use from Voy.com and is actually stored on their site. Anyway... thanks for letting me know and for helping so many people on our message board. 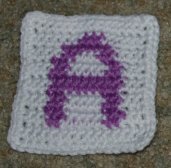 Your idea of sewing the crocheted letter on would work very well also. If you decide to use this method I suggest using an invisible sewing thread and stitch it through the front side of the crocheted work only. I really enjoy your patterns. I belong to the Auxilary of cross roads hospital.I would like to make some for our bazaar with your permission ..Thank you. JoeAnn Chambliss Mt.Vernon ill.
hi i just came across your pattern for a friendship bracelet that i loved! I recentally made it,and im just wondering if i could sell them this summer? You have my permission to sell items made using my patterns. 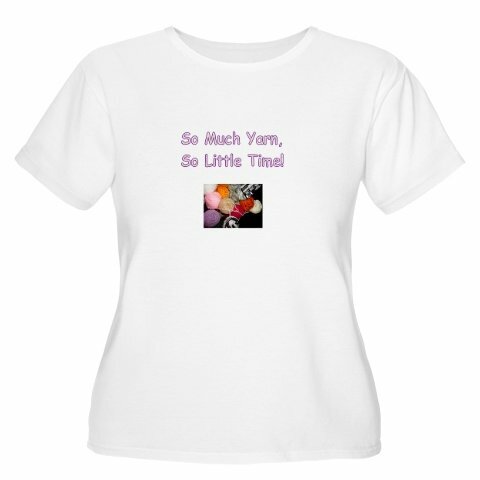 Please note that not all patterns on my website are my designs. 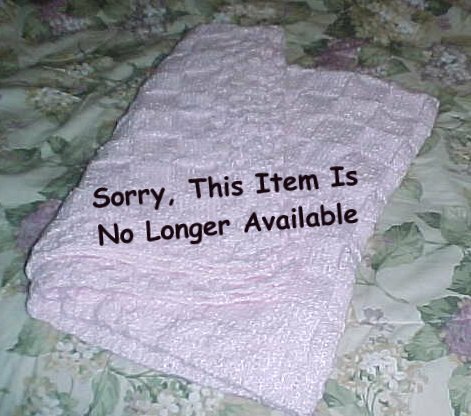 Also, please do not sell my patterns or repost/reprint them anywhere. I just thought you might be interested in the fact that the baby sandal pattern that you are offering on your site for free is being offered for sale http://www.auction-warehouse.com/lot.cfm?lotID=235103 I know how frustrating that can be as I also design and offer patterns free on my blog. I just wanted to let you know that it looks like someone is trying to use your Baby Sandals Crochet Pattern (see the photo above) to make money on it and I thought you should know or be aware of it. Here is the link so you can check it out http://www.auction-warehouse.com/lot.cfm?lotID=235103 . I just couldn't let someone take something that belongs to you and maybe claim it as their own. Hope I haven't upset you by letting you know--I just am looking out for you my dear Friend. Thanks for the information. Anytime you see a pattern for sale that you know is one that is offered "free of charge" online. Tell all your friends where to get it for free so nobody pays for something they don't have to. Thanks! Ch 3, dc in next 3 dc, *in ch-3 lp of next corner work corner: corner in corner made: dc in next 4 dc, ch 3, sk next ch-3 lp, sc in next ch-2 sp, ch 2, sc in next ch-2 sp, ch 3, 2 sc in next ch-3 lp; sc in next 6 sc, 2 sc in next ch-3 lp; ch 3, sc in next ch-2 sp, ch 2, sc in next ch-2 sp, ch 3, sk next ch-3 lp, dc in next 4 dc; rep from * 3 times more, ending last rep without working last 4 dc; join in 3rd ch of beg ch-3. I am having trouble understanding the ...next corner work corner; corner in corner made...part. Thanks so much for this website and any help you can provide! >> I am having trouble understanding the ...next corner work corner; corner in corner made...part. in the chain 3 loop. Thank you for writing. I'm sorry to say but the hooks are actually purchased through Joanns... I'm an affiliate for them which means you purchase through my site from theirs. I'm not sure if they ship to Australia or not. Your solid diamond square--I have crocheted for years but do not know how to do this one. I would like to adapt it for a baby afghan for charity using scrap yarn in two colors only. My question: Do you carry the second color on the back and crochet over it as you go, using that second color as necessary? Seems like it would make the afghan quite heavy for a baby although I will be using sport weight yarn. 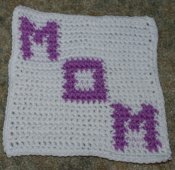 I want to do a semi solid afghan because some of the children may not have warm places to live or sleep. I am in Tennessee and take my box of items, caps, blankets, scarves, etc., to the shelters in November of each year. Our winters can be COLD. If you have a better suggestion, I would appreciate it. Sincerely, Jennie Horner, Talbott, TN. I carry the unused color along the top of the stitches until it is needed again... being careful to drop it where it will be needed again on the next row. I don't think that makes it heavy. SUSAN (age 4) was drinking juice when she got the hiccups. "Please don't give me this juice again," she said. "It makes my teeth cough." David and Bernice had just given their teenage daughter family-car privileges. On Saturday night she returned home very late from a party. The next morning her father went out to the driveway to get the newspaper and came back into the house frowning. At 11:30am the girl sleepily walked into the kitchen, and her father asked her, "Sweetheart, what time did you get in last night?" Her father said, "Then, my precious one, I'll have to talk with the paperboy about putting my paper under the front tire of the car." You listen to talk radio. Your daughter says she got pierced and you look at her ears. When someone mentions SURFING you picture waves and a surfboard. You turn down free tickets to a concert because you have to work the next day. You bought your first car for the same price you paid for your kid's new running shoes. A woman phoned her husband at work for a chat on her new cell phone. A couple just started their Lamaze class and they were given an activity requiring the husband to wear a bag of sand -- to give him an idea of what it feels like to be pregnant. The husband stood up and shrugged saying, "This doesn't feel so bad." 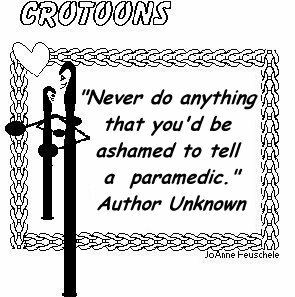 The Lamaze instructor then dropped a pen and asked the husband to pick it up. "All of us were so glad that the fire your husband had while you were gone was confined to the kitchen. "Do you think you were born? In a barn?" just like you....Then you'll see what it's like."